Using Ansible for executing Oracle DBA tasks. This post looks like I am jumping on the bandwagon of IT orchestration like a lot of people are doing. Maybe I should say ‘except for (die hard) Oracle DBA’s’. Or maybe not, it up to you to decide. Most people who are interested in IT in general will have noticed IT orchestration has gotten attention, especially in the form of Puppet and/or Chef. I _think_ IT orchestration has gotten important with the rise of “web scale” (scaling up and down applications by adding virtual machines to horizontal scale resource intensive tasks), in order to provision/configure the newly added machines without manual intervention, and people start picking it up now to use it for more tasks than provisioning of virtual machines for web applications. This entry was posted in Uncategorized on September 14, 2014 by dbastorage. I know I should not be surprised by the recent unbelievable 5x / 10x claims comparing Oracle’s Sun ZFS Storage Appliance with EMC and other vendors “legacy” products, but they really were not comparing similar purpose products to their own. I firmly believe EMC prides itself on providing informed customer choice and a breadth of products to most often exceed customer requirements. With that in mind, the right way for technical people like us to respond to this form of old-style marketing is to either present our strengths and leave the customer to decide, or preferably become sufficiently familiar with Oracle’s competing products to be fair and compare them with our own, ensuring the right questions are being asked of both our competitors and our own specialists to the benefit of our customers. Having recently come across references on EMC Support and ECN describing VNX, Isilon and XtremIO Simulators available for download, I began to think how cool it would be if Oracle had a simulator for their ZFS appliance that everyone can use for testing and after a quick search on Google, below is an introduction to what I found. You must be registered with an account on Oracle’s Technology Network (OTN) and then perform the following steps to download, install and configure the Sun ZFS Storage Appliance Simulator. Hardware requirements for the Oracle VM are a healthy 2GB RAM, 1 CPU and 125GB HD space, this is a storage simulator with a 50GB system disk and 15 x 5GB disks for testing purposes. In the GUI provided, you actually get a view of the storage array and can click on individual disks for information. Install and start VirtualBox 3.1.4 or later. Download the simulator and uncompress the archive file. Select the VM labeled “Oracle_ZFS_Storage” and check the Network: Adapter 1, I had to change this to “Bridged Adapter”. After you enter this information, press ESC-1, then wait and you will see two URLs to use for subsequent configuration and administration, one with an IP address and one with the hostname you specified. Use the URL with the IP address (for example https://192.168.0.101:215/) to complete appliance configuration. The login name is ‘root’ and the password is what you entered as @@@@@@@@ above. It is best now to download the Oracle ZFS Storage Appliance Simulator Quick Start Guide and starting on page 5, follow the steps to confirm the settings screens, check the values entered and click COMMIT to continue. With this simulator, you can get a feel for the GUI and storage features available in a Sun ZFS Storage Appliance, and have a better-informed conversation with our customers about the features and functionality available. This entry was posted in Uncategorized on August 19, 2014 by dbastorage. 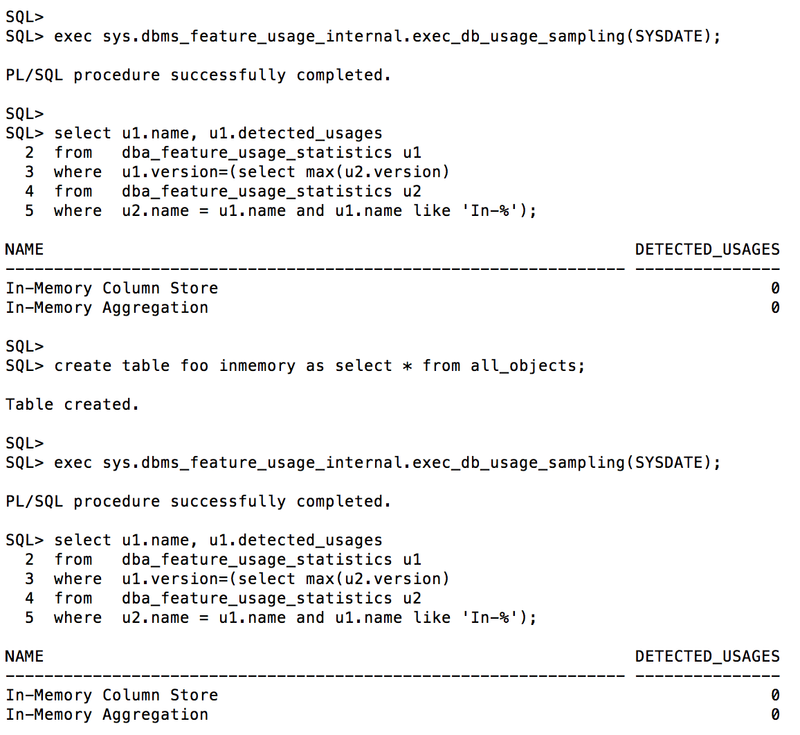 Disabling Oracle’s new 12.1.0.2 Database In-Memory option, or perhaps not! You may already be aware of there now being a number of online articles and blog posts concerning issues around the potential for accidental enabling of the new Oracle Database In-Memory Option; with pricing understood to be the same as for Oracle’s Real Application Clusters and Oracle’s legendary tough stance on license audit findings, it is not difficult to see why this has got the attention it has. The initial InformationWeek Report: Oracle Patch Turns On $23,000 Upgrade, was followed on 28th May by CBR Online reporting Oracle Denies Its £14,000 In-Memory Option Activates By Default and then PCWorld.com Oracle hits back at ex-employee’s claims over in-memory database option. My years in the IT industry certainly mean it is no surprise to me that my colleague at EMC, Kevin Closson, having raised awareness of the issues on his now 4-part personal blog, nevertheless I am disappointed that he has been subjected to criticism and occasional ridicule from so-called IT industry experts and apparently from some of his former colleagues at Oracle Corporation. In her blog post Getting started with Oracle Database In-Memory Part I, Maria Colgan, Oracle’s Product Manager for Oracle Database In-Memory, has attempted to address the issues raised without mentioning them directly, by starting with the intention to answer the question “how and when is Database In-Memory installed and enabled”. My initial response was enthusiastic, I still believe Maria has made a positive contribution to the discussion, I commented as such on her blog post, as I believed she had provided clarity on how to avoid accidentally enabling the new Oracle Database In-Memory Option and as a result avoid exposure to potential license audit problems. However, it has become clear after my own testing that Maria and her colleagues need to look at this again. 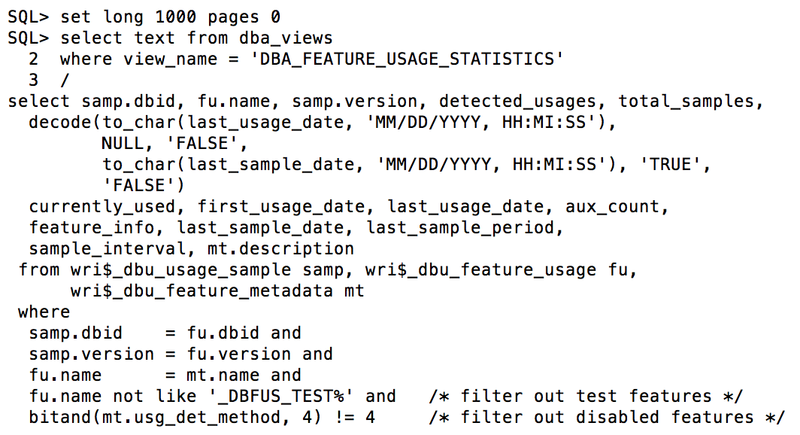 This is due to what I have described as “no rows selected” == “DOUBT” – the SQL SELECT statement used to enquire of the feature usage in the Oracle Database makes use of a dba_feature_usage_statistics view that joins 3 WRI tables and in my tests one of these tables (WRI$_DBU_FEATURE_USAGE) is empty! However, when the tests are performed using the orclpdb PDB, installed as part of the Typical Installation of the Oracle Database 12c 12.1.0.2 software, I see output similar to that provided by Kevin Closson. I say similar, as you can see below I am yet to reproduce his output that has resulted in such controversy! Clearly, there is something different about our tests, perhaps some sqlplus flags or other settings. What we need to do is share the exact configuration and commands and get to the bottom of this in a mutually agreeable and respectful manner, let’s see what we can do. This entry was posted in Uncategorized on July 30, 2014 by dbastorage. Will the All-Flash Array Market go away? Recently HDS’s Hu Yoshida wrote in his blog that he thinks the all-flash array market will go away. I very often find myself agreeing with Hu, he’s a sharp guy and I respect his point of view. As an example, later in that same blog he predicts that file sync and share will become a component of object storage; I agree with that. But as for the disappearance of the all-flash array market I have to disagree. Not only will the all-flash array market not go away but I believe that over the next 5-6 years it will become the only way that production data is stored. This entry was posted in Uncategorized on July 29, 2014 by dbastorage. EMC XtremIO – The Full-Featured All-Flash Array. Interested In Oracle Performance? See The Whitepaper. I recently submitted a manuscript to the EMC XtremIO Business Unit covering some compelling lab results from testing I concluded earlier this year. I hope you’ll find the paper interesting. This entry was posted in Uncategorized on July 16, 2014 by dbastorage. This entry was posted in Uncategorized on July 8, 2014 by dbastorage.